Note: The short game stance is used on shots where accuracy, consistency and “distance control” are more important than raw distance. Hitting with your feet together will generally reduce the total distance for each club by 20-25% but dramatically increase the accuracy, consistency and distance control. The short game stance works really well and will take strokes off your game but please do some range practice before you take it out on the course. Simple Golf is all about making golf simpler. Probably the easiest way to make your short game simpler (and take strokes off your game) is to hit all your short game shots with your feet together. 1. Put your feet together (touching) or a close as reasonably possible for you. The further you have your feet apart the more likely variables will sneak into your swing. When you have your feet apart moving your head even an inch can shift your weight to your opposite foot possible changing the bottom or your swing arc causing a fat or topped shot. Keep you feet together (weight on the front leg) and fat or topped shots will be dramatically reduced. Keeping you feet together dramatically reduces extra motion in your lower body. Your core (your upped body – shoulders, chest & abdomen) control the swing. YOU DON’T NEED RAW DISTANCE WITH YOUR SHORT GAME YOU NEED ACCURACY AND CONSISTENCY.Keeping your feet together will reduce your overall distance by about 20-25 percent. That’s okay because it will make you much, much more accurate and much, much more consistent. Overnight keeping your feet together will take strokes off your game. On shorter shots your your back hip will stay pretty still. One medium and longer pitches your core will pull you back hip away from the ball allowing a bigger turn. We don’t want a lot of hip movement here but the back hip definitely does move back away from the ball on longer shots. Yes, you’ll have to practice just a bit to get use to the shorter distances and keeping the weight on the front leg but learning that is actually pretty easy. You should be able to use this technique easily out to 50 yards or so. Longer hitters will use this technique out even further. I keep my weight on my front foot (and even keep my feet together) anywhere from 100 yards and it. At 100 yards I used my Pitching Wedge which I normally hit 125 yards with a full swing PowerSet Stance. I put my feet together and weight on the front foot and I then hit this wedge very accurately and very consistently up to 100 yards. I use to use my full swing sand wedge from 100 yards but now I’m more accurate and more consistent with my feet together using the PW at 100 yards. As I said, most people are comfortable out to about 50 yards with their feet together. You have to experiment on the range to find the maximum distance at which you’re comfortable. Filed Under: Short Game Stance, What Is Simple Golf? The Symple Chipping System is the simplest, most accurate and most consistent way to chip. The 20 minute video below explains it in full. Below the video there is a link to an ebook with pictures and written explanations. to save the Ebook To Your Computer. If you have any problem downloading the ebook just send a blank email to chipping@simplegolf.com and we’ll email you a copy of the ebook. We strongly recommend downloading The Chipping Ebook because it has detailed pictures of the Power Thumb grip which is quite helpful. You will need a free Adobe Reader to view this Ebook. If you don’t have one you can download your free reader here: http://www.adobe.com/products/acrobat/readstep2.html You should have the latest version of Adobe Reader installed as some of the earlier versions do seem to work with the new PDF files. I hope that helps. Here are a couple of short game tips. We talk about chipping with your weight on your front leg. Here the easy way to do that. Address the ball with your feet together than stand only on your front leg. To balance on just your front leg you’ll find you’ll need to shift your hips toward the target. 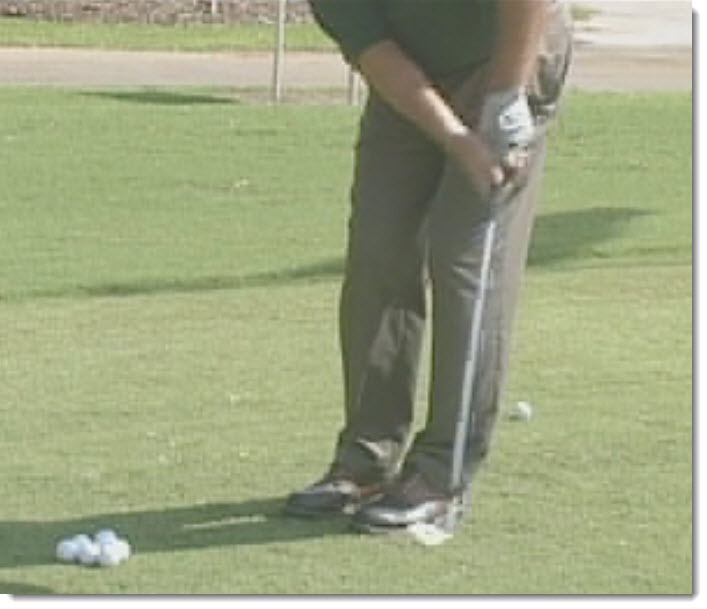 (Your front hip will actually be outside (toward the target) your front ankle. That’s exactly the position (except you can put your back foot down) that you should be in when chipping. That position ensures that you keep most all you weight on your front leg. BTW, the main reason you need to keep most all your weight on your front leg is CONSISTENCY. When you keep your weight on your front leg your upper body doesn’t’ move around as much and the bottom of your swing arc become much, much more consistent. The Symple Chipping system is a core (shoulders, chest & abdomen) powered system. We talk mostly about the shoulders but in fact we’re using all the large muscles of the core. Using “large muscles” is a much more consistent and accurate method of chipping than trying to depend on the small twitchy muscles of the hands, wrists and arm. Try hitting all your short game shots at least from 50 yards in (maybe more) with your feet together and your weight on your front leg. I guarantee that will not only improve your consistency but it will also dramatically improve your accuracy. To see the whole Simple Swing Short Game DVD Video (normally $29) online for FREE. Just register for the Simple Golf Forum here now. It reviews chipping then it covers short and long pitches, lob shots and sand shots. ﻿If you have any questions at all about the Simple Swing Short Game or Symple Swing please feel free to submit the questions through our Simple Golf Helpdesk system at http://www.SimpleGolf.com/helpdesk That’s actually the quickest way to ask a question and get a prompt response because everything is tracked. I get so much e-mail (most of it spam) that sometimes I can miss an e-mail but that doesn’t happen with the Helpdesk. You can also call me directly at 203-794-4900 with questions. Filed Under: FREE SIMPLE CHIPPING DOWNLOAD, Short Game Stance, Start With The Simple Short Game, What Is Simple Golf?